Concerned over delays in payments of development works due to ongoing strike by panchayat assistants throughout the state for more than 10 days now, the Panchayati Raj Department has sought report from the districts and is also contemplating disciplinary action against them. The independent authority to be set up for regulating functioning of private universities will have powers to summon parties and impose penalties up to Rs 5 crore for contravention of its rules, regulations and directions. New in charge of BJP Affairs in Himachal Pradesh Kalraj Mishra will arrive here tomorrow to hold meetings with senior party leaders and office-bearers to chalk out the strategy of the party on various issues. The government came in for criticism for opening the floodgates for private universities from the Opposition Congress, which alleged that the policy was leading to commercialisation of higher education and downgrading of academic standards in the state. A 35-year-old man, Anil Kumar, of Chirgaon in the Rohru area of the district died of swine flu today. The Public Works Department (PWD) has not been able to start work on as many 266 road projects for want of the mandatory clearance under the Forest Conservation Act. The CPM today demanded resignation of Horticulture Minister Narinder Bragta on account of failure of the government to protect the interest of fruit growers and agriculturists. A State Forensic Science Laboratory (SFSL) test has found that truck driver Rajinder Singh, who was driving the ill-fated truck that fell into a gorge killing 39 persons yesterday, was drunk. As soon as 37 bodies started arriving in Sidhyani village after the post-mortem examination today, a pall of gloom descended in the family of Chet Ram and his brothers who lost 12 members, including eight women and four children, in the truck accident near here yesterday. Identity of the woman who was found in a semi-conscious condition from the local bus stand by the police on August 15 remains a mystery even after lapse of five days. Suraj Bhan, a 71-year-old undertrail, who was in judicial custody in Mandi jail, died at Tanda Medical College on Tuesday. About a 1,000 panchayat assistants working throughout the state have been observing indefinite strike since August 9 to press their demand for regularisation of their services after seven years and paying salary to all others as per their technical qualifications. The strike of panchayat assistants has created a lot of problems in making assessments of many development works at panchayat level as all payments related to these works are made only after getting assessment reports from these panchayat-level officials. The situation is quite alarming in the development works being carried under the Mahatma Gandhi National Rural Employment Guarantee Act (MNREGA) in almost all panchayats since payment to all people working in the rural areas under different schemes are made after getting assessment reports; more so since main purpose of this scheme is to provide employment under this Act and large number of these are paid on daily basis. There exists total 3,234 panchayats in the state and on an average development works of about Rs 6-7 lakh per month are being carried in each panchayat under MNREGA, besides other developmental works. According to information, the lack of assessment reports from the panchayat assistants has affected payment under large number of MNREGA and other schemes at panchayat level. Concerned over this development, the state Panchayati Raj Department has sought reports from all project officers heading rural development projects in the districts about the impact of the strike of panchayat assistants leading to delay in assessment and payment to workers under the ongoing development schemes. The Himachal Pradesh Private Educational Institutions (Regulatory Commission) Bill introduced in the Vidhan Sabha by Education Minister ID Dhiman today provides for establishing a commission vested with powers to monitor and regulate fee structure and ensure that admissions are based on merit achieved in national or state-level common entrance test of any other test notified by the government and enforce rules, regulations and guidelines issued by various regulatory body and government. It can even recommend closure of an institution in case it successively fails to meet the standards. In case of contravention of any rule, regulation and its directions the commission can impose a penalty not exceeding Rs 1 crore in the first instance and up to Rs 5 crore in subsequent contraventions. It will consist of a chairperson and maximum of two full-time or part-time members from among persons of eminence in the field of higher education or have remained principal secretary to the Government of Himachal Pradesh for a period of three years. The chairpersons and members will be selected by a search committee comprising chief secretary (chairman), principal secretary (technical education) and principal secretary (higher education) who will be member secretary. It will develop a mechanism for receipt and redressal of grievances of students and parents and direct the private institution to put in place a proper mechanism to handle complaints within a fixed time with details of the steps taken. Minister for Social Justice Sarveen Chaudhary introduced the Himachal Pradesh Maintenance of Parents and Dependents (Amendment) Bill to make it conform to the central Act which was more comprehensive and, unlike the state Act, also applicable to Muslims. Great significance is being attached to the visit since Mishra, BJP stalwart from Uttar Pradesh, will arrive here for the first time since he being entrusted the task of party affairs in Himachal. It is only recently that national chief Nitin Gadkari appointed Mishra in place of Satya Pal Jain, a former MP, heading the National Legal Cell of the BJP. Mishra will arrive here tomorrow at 9 am from Delhi along with Rajya Sabha MP and former Chief Minister Shanta Kumar. He will meet Chief Minister P.K. Dhumal, Shanta Kumar, state BJP chief Khimi Ram and other senior leaders. All MPs and senior party leaders from Himachal in the Centre too will be present. The agenda for the state executive meeting scheduled for August 21 is likely to be discussed with the senior leadership. Being a leader with a very strong RSS background it is being expected that Mishra would lay special thrust on strengthening of the party organisation at the grassroot level. The immediate task at hand for him will be ensuring a good performance of BJP-backed candidates in the Panchayati Raj elections due in December this year. The party programmes will be decided during the next two days. “He will carry out appraisal of the party programmes on price rise, misuse of the CBI and other issues undertaken in the past,” said an MLA. Though Jain, who hailed from Chandigarh, was a frequent visitor to Himachal because of his proximity to the hill state, Mishra will probably not be able to take out that much time. The issue came up during a debate on the Maharishi Markandeshwar University (Establishment and Regulation) Bill which will replace the Ordinance issued in June. Congress members expressed concern over the hasty manner in which new universities were being set every other day and wanted to know the reasons for promulgating an Ordinance. Kuldeep Pathania (Congress) pointed out that there were numerous complaints against private universities, particularly Chitkara University, with parents alleging exploitation of students and over-charging. Most of the universities had come up in Solan district and the interests of the state had not been safeguarded as only 25 per cent seats had been reserved for students of the state whereas in southern states more than 60 per cent seats had been set apart for the locals. There was no system for ensuring that admissions were given on merit. Harsh Wardhan (Congress) lamented that no reputed educational group had set up university in the state. He suggested that the government should only give provisional approval to universities at the first instance and if these come good over a period of 3 years or so, only then regular approval should be considered. G.S.Bali (Congress) said universities were purely a commercial venture. It would be appropriate if the government should invite tenders for allotment. The Bill was passed after Chief Minister P.K.Dhumal said a regulatory commission would be set up to oversee the functioning of private institutions and suggestions of the Opposition would be incorporated in the Bill to be passed during the current session in this regard. The House also passed the Himachal Pradesh Prohibition of Cow Slaughter (Amendment) Bill 2010 in the state assembly today providing for search and seizure of vehicles used for transporting the cows to other states. Anil had been admitted to Indira Gandhi Medical College two days back and it was confirmed that he was suffering from swine flu. With reports of other suspected patients of swine flu in the Chirgaon area being received here at the state headquarters, a rapid response team had been sent to the area to take stock of the situation. 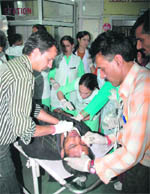 The Indira Gandhi Medical College authorities confirmed that Anil had died of swine flu. This was stated by PWD Minister Gulab Singh in the Vidhan Sabha during the Question Hour. He said the government had taken steps to expedite the process for obtaining clearance but the procedure was quite tedious. The problem was compounded after the Supreme Court ruled that states would also have to pay the Net Present Value (NPV) of the forest land involved for obtaining clearance. The government paid Rs 26.02 crore as the NPV in 2009 and this year it had earmarked Rs 13.55 crore for the purpose. He said detailed project reports of 266 projects, including 167 roads, had been prepared. THE NPV had been paid in respect of 202 roads out of which 71 cases had been granted final approval. Irrigation and Public Health Minister Ravinder Ravi told Congress leader Mukesh Agnihotri that it would not be possible to take up work on channelisation of Swan river in Una on the 2.5 km stretch from Taliwal to Bhathli, which fell in Punjab territory, until an agreement was reached with the neighbouring state on the matter. He said 16.63-km length of the river had been channelised at a cost of Rs 74 crore and the total cost of the project was Rs 106 crore. The government had taken up the matter with Punjab and had also approached the Centre in this regard. In a written reply, Industries Minister Krishan Kapoor informed Gangu Ram Musafir of the Congress that as many as 6,200 cases of illegal mining were detected from July 30, 2007, to July 28, 2010, in the state. While 2,722 cases were compounded to recover a fine of Rs 1.18 crore, 3,133 cases were pending adjudication in various courts. Further, the courts disposed of 2,061 cases in which offenders were fined Rs 26.25 lakh. He said all assurances given by the government on road maintenance, availability of trucks and packaging material at reasonable rates had proved to be hollow. “The condition of roads is so bad that operators are not willing to send their vehicles. In fact, after seeing the plight of growers, they are demanding exorbitant freight charges,” said Tikender Singh Panwar, Member State Secretariat. He said the BJP regime had adopted a very casual approach towards demands and problem of apple growers. “Nothing has been done so far to prevent agents from charging commission of 6 to 8 per cent from growers at Delhi fruit markets, which results in a loss of Rs 800 to the growers,” said Panwar. He demanded that owing moral responsibility regarding the issue, Bragta must resign. The mishap has also exposed the fact that zonal hospital here needs a surgeon and a trauma centre to take care of accident victims. The police has registered a case of criminal negligence under Section 279, IPC, against the driver and started proceedings of cancelling his driving licence. Those who lost their relatives and friends in the mishap hunted for the truck driver as they hold him responsible for the accident as he was allegedly drunk. Suspecting trouble, the driver was shifted to the ENT ward by the hospital authorities and he was discharged today as hesustained minor bruises, said doctors. Meanwhile, the SFSL examination of urine and blood samples of Rajinder Singh has found the presence of alcohol in his body giving credence to the villagers’ suspicion that the driver had consumed liquor before driving the truck. Though the SDM heading magisterial accident committee has yet to submit its report on the truck mishap, the spot examination revealed that the “road is tarred and has kacha side tracks on both side”. On the other hand, the mishap has also exposed the fact that the Regional Transport Authorities (RTA) and the police have failed to check the misuse of goods-carrying vehicles for travelling of passengers. The shock was understandable as Chet Ram, Hemraj, Jeet Ram and others could not utter words to mourners. Other 25 bodies were cremated in the Leda area in a tearful atmosphere. Those who died in the accident included Rama Devi, wife of Chet Ram; Dharmender, son of Sohan Singh; Banti Devi, wife of Netra Singh; Banita and Puja, both daughters of Hemraj; Lata, wife of Hemraj; Kamla Devi, wife of Sher Singh; Prince, son of Parkash; Khimi Devi, wife of Narotam; Hansa and Dharma Devi, daughter and wife of Jeet Ram, respectively; and Janki Devi, wife of Shiv Singh. Transport Minister Mohinder Singh Thakur, Congress president Kaul Singh Thakur, Mandi Sadar MLA Anil Sharma, Balh MLA Parkash Chaudhary, Milkfed chairman Mohan Joshi, zila parishad chairman Baldev Saini, former Sundernagar Congress MLA Sohan Singh, former Balh BJP MLA Damodar Das, including Mandi SP SM Agnihotri, Mandi ADC HR Chauhan, attended the mass cremation in the village. They also visited the injured in the hospital. The Transport Minister gave an immediate relief of Rs 20,000 to the next of kin of the deceased and Rs 15,000 to each of the injured. He also assured that the 36 injured patients would get free medicine and treatment. Kangra SHO MN Chouhan said the police was told that a 32-year-old woman was found lying near the bus stand in a bad shape. According to medical superintendent Dr DB Sood, the deceased was under treatment for skin disease in the hospital and was suffering from septicemia. He was under treatment in the hospital for the past nearly two months. According to police sources, Suraj Bhan was arrested at Bunter under the NDPS Act and was in its custody at Mandi jail before being admitted at Tanda college.